Victorian ca. 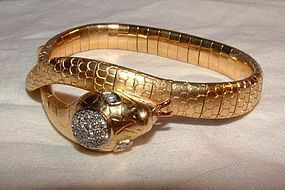 1880 very very flexible 15k yellow gold wraparound snake bracelet, 24 inches long (if laid flat), can be shaped to fit almost any size, option of wearing on upper arm. 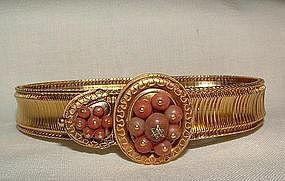 Head of bracelet accented with two tiny ruby eyes. Rare! 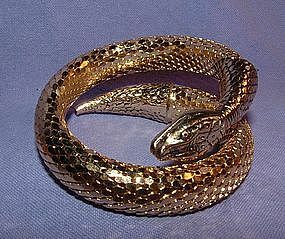 Excellent condition Length (if unspooled): 24 inches Width: 7.5 mm (5/16 inch) Width of snake head at its widest point: 12mm Weight: 43.3 grams, Layaway available. 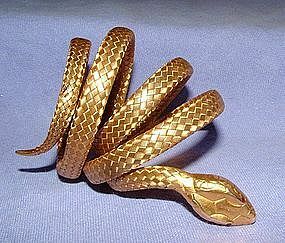 Beautiful vintage goldtone flexible snake bracelet by Whiting & Davis, probably from the 1940s. 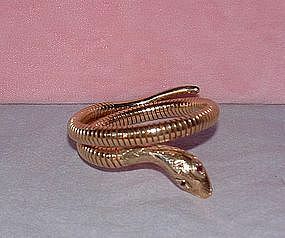 Total length approximately 11 inches (if unraveled), hallmark on back of snake head unreadable. Excellent condition! 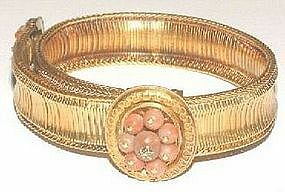 Rare, hard-to-find 18 ct yellow gold mesh sliding bracelet with coral beaded center piece with tiny diamond in the center. End piece also with coral beads, beautiful, intricate Etruscan bead work in perfect condition, rare for a bracelet of this age! Width of bracelet is 12 mm (approx 1/2 inch), width of centerpiece is approx 23 mm, maximum wearable length is approx 8.5 inches. Amazing deco 14k yellow gold flexible bracelet, made up of individual links on a steel spring to form the look of twisted gold. 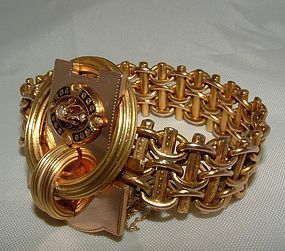 Total length of bracelet is approx 7.5 inches, 6mm wide, weight is 19.4 grams. 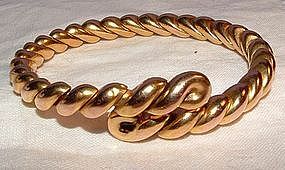 Very unique and rare style of bracelet. 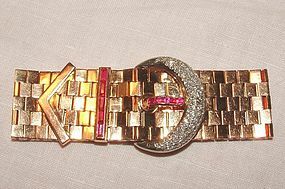 The concept is similar to how a slide bracelet works, except on this bracelet, all the pieces are the same to form one continuous, unbroken look. LAYAWAY AVAILABLE! I have a bar pin that matches this bracelet, ask me if interested! 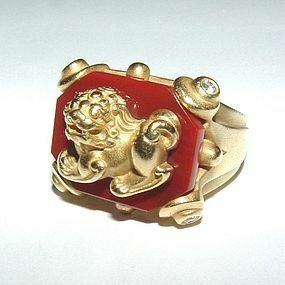 English Victorian 18K yellow gold snake ring circa 1900 - 1910 (hallmarked) with an oval carnelian stone (9mm x 7mm) intricately engraved with initials, ring size 8 - 8.25,weight is 8.1 grams. 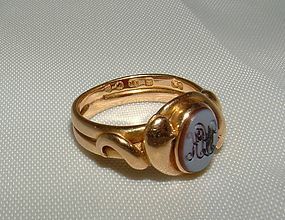 Can be easily re-sized by a competent jeweler. LAYAWAY AVAILABLE! 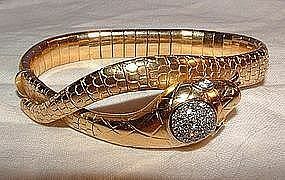 9 ct yellow gold Victorian flexible snake bracelet, adjusts to fit almost any size wrist. Total length (if unraveled and laid out) is approx 11.5 inches. Intricately engraved on both the head and tail, with 2 tiny garnets for the eyes. 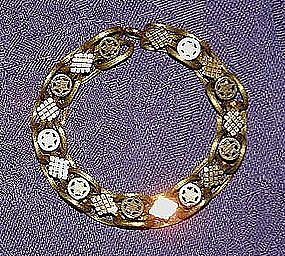 Extensively Hallmarked on the back of the head as follows: 375, S&P, and 3 hallmarks-- a basket, an anchor, and what looks to be a C or an L. Width of the bracelet is approx 1/4 inch. Excellent condition, easy to wear! Rare! 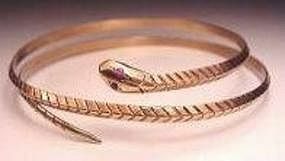 Large flexible snake bracelet, 14 KT yellow gold, can be gently shaped or reshaped to be worn on the upper arm. Total length (if completely unraveled and laid out straight is approx 17 inches, current diameter is 2.5 inches. Weight is 16.8 grams. Marked 14K on back of snake head and on back of snake tail.